Marriages unravel. People have emotional meltdowns. But rarely do these events lead to a police standoff, a town shutdown, and a violent suicide. Almost 18 years ago, the lives of Kathryn Craft and her sons were changed forever. On the morning that she and her husband Jeff were supposed to separate, he returned home and barricaded himself on their property threatening to shoot himself. By the end of the day he was dead, and the trauma of the event would forever haunt their memories. Her sons were eight and ten at the time of the tragedy. With Far End of Happy, Craft’s second book, she has taken on the subject of suicide, exploring the personal experiences through fiction. Calling herself a “relentless meaning-seeker,” Craft says that she always knew that one day she would have to write about what happened. The story begins quickly, with events becoming tense and frightening almost immediately, and the pace continues right to the end. Not only do we live through the full day of the police standoff, but we experience the complexities of the family dynamics under crushing pressure. The pace of the work gives it the feel of a suspense novel, and the compression of the events into a single day’s time maintains a sense of urgency throughout. Working through her memories and writing the story in a fictionalized way, Craft was able to explore the events through not only her own memories and emotional responses, but through the perspectives of her own mother and Jeff’s mother. She was able to explore the efforts of the police and the townspeople in trying to keep her husband alive. This allowed her to explore the experience in a way that acknowledged the effect a suicide has on an entire community of people. Their fear and struggle was a shared, almost tribal, experience. "To step inside the skin of others who were involved emotionally was healing for me," Craft says. "At the time, I was in the bottom of my own maelstrom. This gave me the opportunity for growth in perspective." While it was through her imagination that she put herself into the minds and emotions of the two mothers, it was through journals kept by her two sons that she was able to recreate their experiences and memories of that terrible time. Her sons, now 25 and 27, were supportive of Craft writing her way through the tragedy they shared. This could not have been an easy story to write. But Craft speaks of the necessity of finally facing the memories and making peace, to the extent possible, with the trauma of such an event. It is not an easy book to read, given the subject matter; it is not light reading. But it is a compelling read, an unflinching exploration of one of life’s most inexplicable horrors. Craft is a talented storyteller, and the most important decision she has made with this novel is to provide an attitude of compassion for every character. Her narrative carries us through to the end of this very horrible day as it simultaneously pulls us into the minds and hearts of the characters. We experience the terror, regret, anger, and sorrow of each family member. It is the strength of each of the women characters that knits the story together, as it must have been that same strength that pulled the family through such a terrible time. 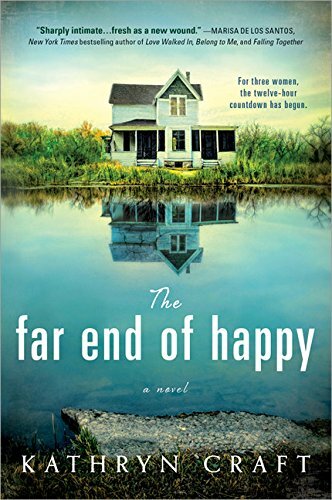 Far End of Happy is a novel well worth reading. While it may not be a light summertime read, it is certainly dramatic and compelling. Kathryn Craft has done the remarkable job of taking the horror of a family’s darkest days and unveiling its meaning through the light of wisdom and acceptance.